This mealworm treat will help attract more wild birds to bird feeders and keep them coming back for more! 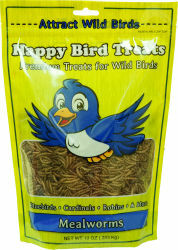 High protein dried mealworms are an excellent source of energy for your favorite feathered friends including bluebirds, cardinals, robins, wrens, and more. Simply place the easy to handle dried mealworms directly into a feeder or mix them with a favorite bird seed to create a custom blend.